A period in Mexican history that had been conveniently and purposely forgotten by the Mexican government until just recently, the 1920’s saw tremendous persecution of the Catholic Church. It was a time of revolution and the revolutionaries felt that the Church was too closely entrenched in the former rulers of the country. Although there was a certain amount of truth to this, the Marxist government that replaced them went far to the opposite extreme. Much like the Communist regime in Russia, religious practice was banned, the churches were closed and priests were either expelled or were in hiding. The government was particularly focused on finding and persecuting priests. This in a country where the vast majority of the people were Roman Catholics. The result of this persecution was the Cristero War, or Cristiada, events are now chronicled in the movie “For Greater Glory” now available in DVD. It is has been a box office success in Mexico, where the events were left out of most of the country’s history books until now. There are also several books on the subject. Miguel Agustin Pro was born January 13, 1891, in Guadalupe de Zacates,Mexico. From his childhood, he was known for his high spirits and happy personality. The son of an affluent mining engineer and a pious and charitable mother, Miguel had a special affinity for the working classes. At 20, he became a Jesuit novice and shortly afterwards was exiled due to the Mexican revolution. He traveled to the United States, Spain, Nicaragua and Belgium, where he was ordained in 1925. Father Pro suffered greatly from a severe stomach disorder. When his health did not improve after several surgeries, his superiors permitted him to return to Mexico in 1926. Father Pro became a great master of disguise and spent the remainder of his life in a secret ministry to the Mexican Catholics who helped hide him from the authorities. Eluding the authorities, he appeared at times as a street sweeper, wealthy businessman (notice the policeman strolling by unaware of Father Pro) or many other characters that he assumed. One time he actually went in to a police station to ask directions! In addition to fulfilling their spiritual needs, Fr. Pro also assisted the poor of Mexico City with their temporal needs. He often visited people in prison (in disguise, of course) to administer the sacraments to those about to be executed by the government. In all that he did, he remained filled with the joy of serving Christ, his King. He and his brother, Roberto, were arrested on trumped-up charges of attempting to assassinate Mexico’s president. Roberto was spared but Miguel was sentenced to face a firing squad on November 23, 1927, which later became his Feast Day. Shown here are two photographs taken at his execution. The executioners wanted to be sure that the word got out of the fate of Fr. Pro, so they invited the media and photographers to witness the event. It was meant to be a warning to others, but had the opposite effect. It merely helped to stiffen the resistance to the crackdown. Father Pro knelt to pray and to forgive those who were about to execute him. With a rosary in his hand he exclaimed “Viva Cristo Rey” (Long live Christ the King) as the firing squad executed him for being a Catholic priest and serving his flock. 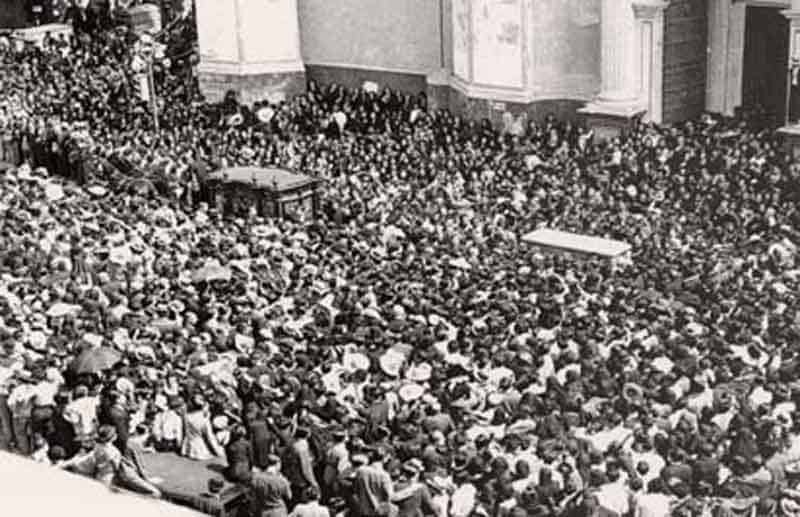 Despite the efforts of the authoritarian regime to repress attendance, his funeral procession, as shown here, drew tens of thousands of the faithful. It was one of the largest crowds ever in the city and must have caused great concern to those in the government who had thought that the execution of Miguel Pro would put an end to the resistance. Such a turnout in face of Government opposition was not what they had expected or wanted. His shrine is located at the Church of the Holy Family in Mexico City. The church is open most hours of the day although they do not post a schedule. Some Catholic tour groups stop here, but many do not, so if it is a place you want to visit be sure to find out in advance. If traveling by yourself, the Rio de los Remedios and Impulsora Metro stations are within a couple of blocks as well as the Rio de los Remedios bus stop. If you visit, be sure to stop at the Church’s gift shop where you can obtain photos such as those shown here and other items. Some of the photos actually contain relics of Miguel Pro (you can see them above), although we have never been able to determine whether they are first-class or second-class relics. They do not take credit or debit cards so be sure to bring pesos. If using public transport, take Line 1, pink line, stop Insurgentes, the Shrine is 2 blocks away at Parroquia de la Sagrada (Church of the Holy Family), and shrine is open 7 days a week, 10am to 1pm and people at shrine speak English. There is no official website for the Church of the Holy Family in Mexico City. Photos courtesy the Shrine of Blessed Miguel Pro. Click here for more information about the Cristero War.